Could anyone putting posts on the Guestbook please put your full name to the post. now that the moyola has went catch and release, does this mean that there will be no-more worm fishing, because if you were allowed to worm fish,the piranha would be a good idea because there would be plenty of dead salmon about. 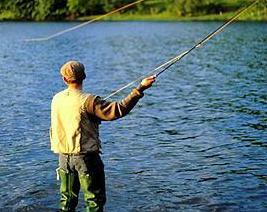 dont get me wrong i am all on for catch and release, as i have released all my fish in the last 4-5 years in the moyola. Paul, At the AGM we voted for catch & release to try and save the stocks of Salmon. We did also say that we wanted to be fair to the members and not ban the worm. If any fish dies during the fight, or because it wasn't returned to the water quick enough it must be presented to a club baliff or a committee member. it will then be given to a good cause in the local community. Great idea T Mac BUT- would you land it using a net or JUST BITE THE LINE? I would like to thank the Moyola Club and certain individuals for the effort they have put in for the conservation of our salmon stock. I think a good idea for the river and its members would be to introduce a few wee piranha into the system while we give the salmon and dollaghan a rest for a year or two, and it would also sharpen up the trout a bit. Apparently they give you a good bite...I mean a good fight!!! They also bred three to four times a year and this would soon get the stocks up, they also dont take flies a lot but take every bait you throw at them. A single a hook and a wire trace is all you need and a good pair of gloves. This idea would also stop a lot of anglers from wading and disturbing the river bed. It would also get rid of a few herons and cormorants. So I think this would be a good proposal at our next meeting , p.s. they taste just like chicken!!!! Committee members can collect their membership card at the next meeting on Monday 20th February.......Please bring your cash with you! Thanks Kevin--------Speedy is holding the fort for you till you get home,,,,so get that work finished up an get home soon. I have today (Thursday 2nd Feb) began sending out membership cards for those who have sent in renewals. When sending renewals please ensure you include the correct fee and a stamped addressed envelope for return of your card. New applicants should note that cards will only be sent out following the committee meeting on the third Monday each month. At Last nights AGM. The members of the Moyola Angling Association unanimously Passed catch and release for Salmon in the 2012 season. They also passed unanimously that Dollaghan over 6lb (25 inches) to be returned in October. This is a very forward thinking club, The C&R for salmon is our way of trying to conserve this great fish which is near extinction. Last night was the largest attendance at an AGM in the Clubs History. Our very own Seamus Donnelly gave a great talk on the group of which he is chairman off, No to Salmon Nets in Irish Waters, this group was only formed a few months ago and has done a lot of work to get the interceptory Salmon nets removed on the Antrim Coast which we hope will not be fishing this year. I forgot to mention last night that the Club is Thirty Years Old this Year, And we still have a few of our founder members sitting on Committee. We are lucky to have such a hard working Committee and a lot of effort goes on behind the scenes. We will have to do something for anniversery, i'll keep you posted to what we do. Tight lines for the year ahead to all our Anglers. Happy New Year to all Club Members and tight lines for 2012. No to Salmon Nets in Irish Waters. Its very important that we get as many names on these letters as possible for the future of our Salmon. We have the letters all ready with envelopes and stamps. All we need is signatures so we will get letters to as many areas as possible today and will have them at meeting tomorrow nite in Castledawson. so please if you have not recieved one,contact any committee member. I am already receiving membership renewals for 2012....thanks to those who are early. The new cards will not be sent out until early February so that any new rules passed at AGM can be included on the card. You will have your card for season start on 1st March. Competition secretarys report. Our dinner dance last weekend was a great suscess,there were still four trophies to sort out. First up was the John Clarke Plaque, this award is for someone who has done a lot of work on our river and hatchery throughout the year, this years winner was Mervyn Finley. Next was the Conservation Award and this is for the person who does a lot of work on the conservetion of our river ,and this years winner was Robert Kerr. Next up was the swimming award, this is for someone who was unfortunate to fall into in the river but usually someone squeals on them if they don't own up,this years worthy winner is our club president himself Patsy McCann. Last one up was the wooden spoon. This award is for someone who did not catch a salmon this season - there was a lot of candidates for this award but last years joint winners Philip Bradley and Philip Maguire decided to give it to a good trout man which I don't think was fair but anyway the worthy winner was Brian Bigmore, so well done to everyone. Hello to all,moyola salmon anglers should get a copy of this months trout and salmon very interesting article of salmon and smolt survival at sea,some of the figures regarding are very disturbing.Which brings it home to us as salmon anglers to do our wee bit to try and preserve the species.